I’ve been away on another canoe trip. A bit different from the last one as this adventure involved whitewater. I’d never done a paddling trip like this before on a long winding river with many, many rapids. I spent a fair amount of time grinning while we paddled 65km of that river. I confess, though, there were times I was a bit nervous. Things can go wrong in a hurry. Mostly they don’t. The yellow canoe is not the one I traveled in (we were 5 canoes in total) but it is the most storied. It has seen many rivers and has touched many rocks. It has some wisdom the other canoes do not. It also has more scars. If you are the older and wiser vessel you will know to carry a roll of Gorilla Tape in your hull. You will know that same tape might be the thing that gets you home in the end. This image is 4 layered photographs. Each layer expresses a different aspect of the trip; The flat water, the landscape, the whitewater, and the fearless yellow canoe. The vertical dark stripe on the canoe interrupts the image, but it belongs there. It is a bandaged scar. The other side sports a similar scar in the horizontal. The yellow canoe was on its last trek. Thank you, Cynthia. It is a lovely river! What a wonderful adventure, Karen. The photo has a very native feel about it which I love..
Hi Helen, it was amazing! I’m still grinning, actually. Thanks very much, I guess it’s kind of like a spirit canoe? like an x-rayed old dutch painting, stories in overpainted layers unveiled, great!! which I find really beautiful. yeah, and also reminds me of Peter Doig’s paintings, I added your work to my ‘virtual’ art museum 😉 , thanks a lot! First time I’ve heard of this river (and Gorilla tape). Sounds like it was quite an experience. Allen, this was the first time I have heard of both the river and the tape, too. It was an amazing experience, I’d go again in a heartbeat. Love the image and the reasons/method/inspirations for the image! It was a very inspiring trip. I didn’t take too many images (and I was using a cheapish camera) but I had just enough to work with to make one image. I’m glad you like, Steven, thank you! I love this image! I immediately thought of it belonging to a children’s picture book. Definitely a spirit canoe, a fantasy wrought of reality and meaning: the kind children understand instinctively. Thank you, Scilla. It was fun to put it together, I’m glad you like it! Yes, a memory picture – I like that description. Love the layering, the composition almost looks like a painting! Lovely! Thank you, David. I like that you think it looks like a painting! What an exciting adventure you had ! And the layered photo is a Digital era equivalent of the Totem. Yet another human challenge to the limitation of the “Moment bound life”. First we invented the Language, then Totem. And now Layered Photo. A layered Totem – that’s an interesting idea. Thanks very much. It has had many good runs, that yellow canoe! I admire your adventurous spirit, Karen. White water canoeing is not for the faint of heart. 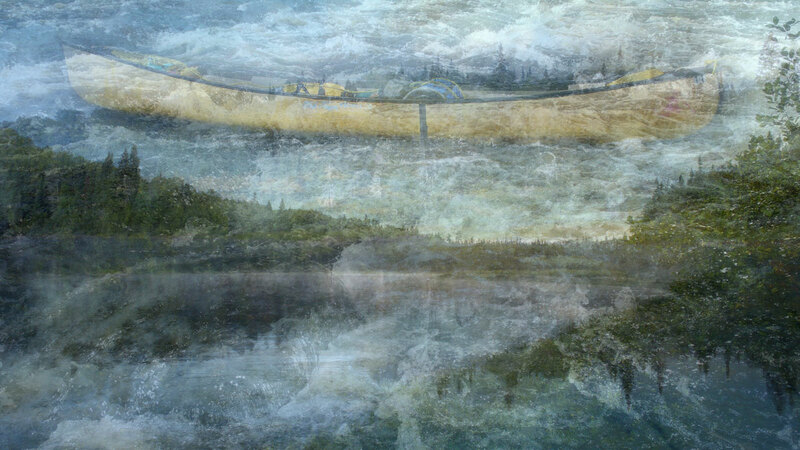 First, this is a stunning image and yes, it looks like a ghost canoe but in such a beautiful way. There is an old children’s book about a little Indian doll who is lost and travels the great waterways of the St. Lawrence in his canoe and I am pretty sure the canoe is yellow. The first person I thought of though, when seeing this image, was Tom Thomson. Beautiful work. I remember in grade school watching the Canadian film inspired by that book (Bill Mason and the National Film Board). I’ve watched it a few times since. Have you seen it? Yes, Karen, thanks for remembering and for the link. I have a first edition of that book – it is well used. I will pull it from the shelf when I get back to Tucson. It seems there are so few books of childhood that took place in Canada. I think that film was released well after I was out of grade school. Your photo could be a book cover for a new edition. Thanks, again. What a fabulous adventure, something I would like to do myself! A remarkable image and a lovely tribute to the ‘fearless yellow canoe’. Now it’s completed it’s last trek through the rapids, what will happen to it … retiring to calmer waters perhaps? You should definitely try it if you get a chance, Simon. It was a really amazing experience! I’m not sure what will happen to the canoe – it now sports a hole(!) along with years of much wear and tear – I think it’s ready for permanent retirement. They all merge together beautifully Karen and become unity. Then after reading your story, each individual layer can be seen in its own light. Excellent. I like your analysis, David. Thanks ever so much for the comment. A really wonderful image Karen. Love it! The texture of the image is so interesting – it’s starting to look three-dimensional like impasto on a painted surface – and the image itself has a look of the American Sublime filtered through your wonderful impressionistic vision. Good on you white water rafting! I like your description – sublime it was! Now i can imagine a little of this trip, great work! Looks like your trip must have been very inspiring. Greetings, Ron. It was fantastic, Ron! Inspiring is right. I have only seen this technique applied in the light room OR only 2 images 4 is quite a task and I see it has paid off for you! Congrats! Oh, it’s fun to play with layers. sometimes you get unexpected things happening that are quite pleasing. I’m glad you like it, thank you. Well thanks for sharing it! I am not much into paddling, I prefer to walk I think, or ride. But your photo is like an adventurous story. How cool are you!?!?! Love the image. Wow you are brave! I’m guessing it was a bit scary, but exhilarating? The image is quite powerful and mystical. The yellow canoe central to the narrative but also obviously symbolic. It’s like the waves are lifting it up, offering it back to the heavens as it completes its final journey. I just sold my 10-year old canoe at a garage sale last week and it’s kind of sad. I will miss it but all the money went to good charity. Enjoy your adventures! I hold my breath when I saw your picture! Beautiful! somehow rich yet light, lyrical yet full of meaning. 4 layers was pushing your luck but you made it work. It gives me the sensation of witnessing parallel universes. I like the layers and the stories that can be told with each one. It’s a beautiful blend, Karen. I’m glad you made it home safely…. such a lovely creation with layers! Awesome! Looks like you have immortalised the soul of that canoe! Lovely image, shape and colour.